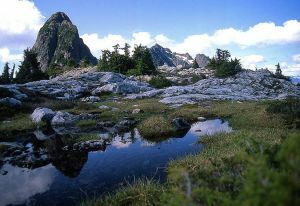 A gently sloped, sub-alpine mountain south of the Golden Ears massif in Golden Ears Provincial Park. The summit offers good views of the summit of Blanshard Peak and the Fraser Valley. A popular hiking trail runs from Mike Lake near the Golden Ears park gates, to the summit, mostly following old logging roads dating back to the 1900's. Name Notes: The mountain was also referred to as "Battery" in the early part of the 20th century. These references persisted into the 1960's.